Open All Year... Belvedere, a new Four Star Hotel, just below the district road and across from the School of Fine Arts, is easily the finest anywhere in Mykonos Town. 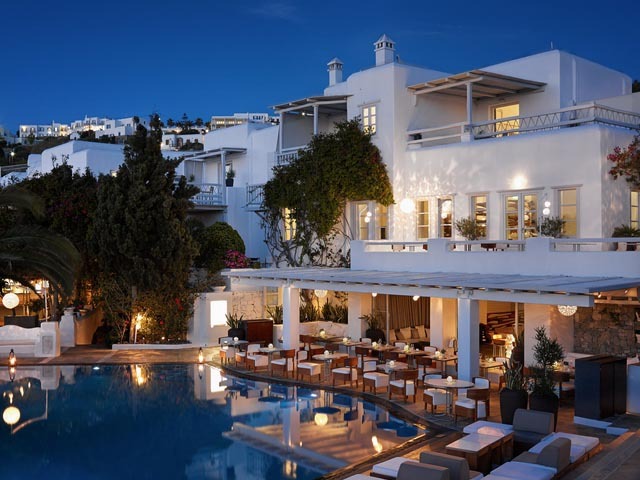 The Hotel Belvedere, a new Four Star Hotel, just below the district road and across the road from the School of Fine Arts, is easily the finest anywhere in Mykonos town. The Hotel and its selected staff are waiting to welcome and show you the real meaning of Greek hospitality. 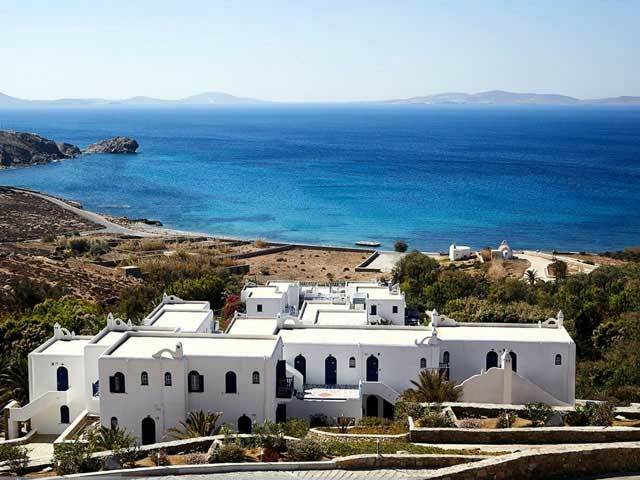 It combines warm and friendly service with modern luxury and spectacular views, right in the heart of Mykonos. The unique Cycladic Architecture, the magnificent view of the picturesque city and the Aegean Sea promise its Guests an unforgettable stay. The Mykonos ambience is carried, almost intact into a theatrical set-up where everyone can become a protagonist in one's own special way. This is an area of transformation where socializing becomes easier in an environment given to unrestrained relaxation. A modern aspect of an old estate at the centre of the town is where the local becomes cosmopolitan. The Hotel consists of 40 Rooms & 6 luxurious Suites. 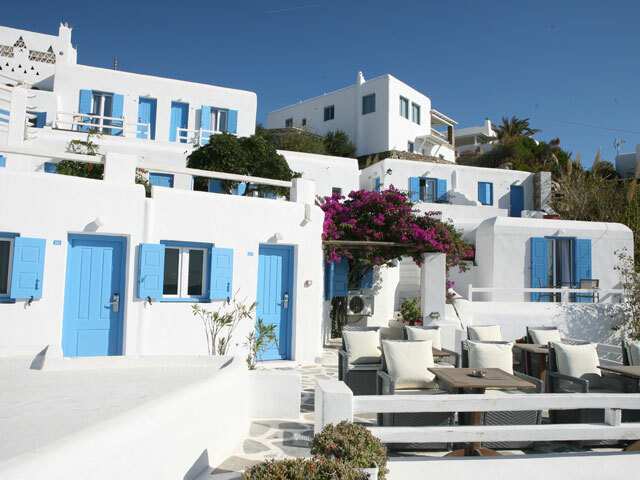 Each has been uniquely designed with taste strictly following the traditional architecture of Mykonos. Baby Cots are also available free of charge. All Rooms & Suites are sunny and comfortable, with floors made of Dionysian marble. They come equipped with Modern Bathroom,Korres Bathtub, Hairdryer, Direct Dial Telephone, Fax & Internet Facilities, Air Conditioning, Colour Satellite TV, Internal Video System, Music, Mini Bar, Body Care Items, Beach Items, Bath Cosmetics, Bathrobe, Cordless Phone that can be used within all the Hotel premises, Voice Mail, and Balcony with exceptional view. The Guest Rooms are 20m2 of useful space, balcony or terrace offering Garden View. The Standard Rooms (Singles, Doubles & Triples) are 20 -24m2 Bedroom, Bathroom, Balcony or Terrace offering Mykonian Courtyard Garden View. The Standard Sea View Rooms (Singles, Doubles & Triples) are 20 - 24m2 Bedroom, Bathroom with Balcony or Terrace offering Sea View. The Deluxe Rooms are 20 - 26m2, on the Upper Floor and have Bedroom, Bathroom, Balcony or Terrace with Private Sun-deck and/or outdoor Lounge (Sea View), DVD Player, Plasma TV, Home Cinema System, Complimentary Transfer on arrival and departure and Express Check-in. The Junior Suites are 26 - 30m2 of useful space, outdoor lounge, open space architecture (some have a separate sittting room and a bedroom), accommodating up to 4 persons, 21'' LCD TV, express check in, Pool - Sea view. The Standard Suites are 35m2 with Bedroom, Sitting Room, 1 or 2 Bathrooms, 2 Balconies or Terraces offering Garden or Pool View and can accommodate up to 4 persons, 21'' LCD TV, Mykonian Courtyard Garden View. These suites constitute the best option for family and friends. The VIP Suites are under renovation. Description will be available soon. All room & suites with Air-Conditioning, Mini Hi-Fi, Body care items, Beach Items, Bath Cosmetics, Bathtub, Hairdryer, Bathrobe, Direct-Dial Phones with Private telephone line and Voice mail, Cordless phone which can be used within all hotel premises, Modem Hook-ups, Mini Bar, Satellite Flat Screen TV. Belvedere's brand-new Fitness Studio is equipped with the latest Nautilus and Life Fitness products and original Jacuzzis. An old Mykonian Mansion, built in 1850 has been lovingly renovated and has been transformed into a unique picturesque Restaurant, which offers a variety of seasonal Mediterranean cuisine. Both atmosphere and food have received rave reviews. The Bar and the Pool of the Belvedere are surrounded by a beautiful garden and the best places for someone to enjoy the wonderful sunsets, while drinking cold drinks or tasting the hors d' oeuvres of the Snack & Pool Bar. 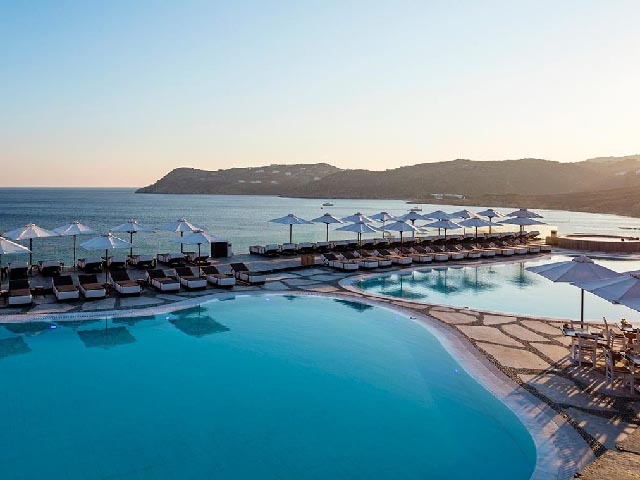 There Hotel also boasts of a Matsuhisa Mykonos, by celebrity chef Nobu Matsuhisa, offering a variety of authentic Japanese and South American flavors. In the morning the Guests can enjoy an American Buffet Breakfast.